The multicolored flowers of Red Mountain® Flame shimmer with long, iridescent orange-red petals that surround a magenta-pink center. This brilliantly colored new hybrid is unique among these popular succulent groundcovers. Blooming in late spring, the flowers completely cover the tight mate of evergreen foliage, creating a carpet of color. Out of flower, Red Mountain® Flame has attractive bright green foliage that turns to bronze over the winter. It’s important to note that Red Mountain® Flame is an entirely different plant from the previously released Red Mountain® (Plant Select 2007) and represents a marked improvement in garden performance and longevity; Flame is also much cold hardier, has larger, more vividly colored flowers and is more drought tolerant. Like all the cold hardy ice plants, this is an excellent choice for planting into flower beds and landscapes mulched with gravel. The gravel keeps the stems and foliage drier and out of contact with cold, wet soil over the winter months for improved cold hardiness. Fight fire with Flame and use this and other cold hardy ice plants as a non-flammable groundcover for fire resistant landscapes in the western US. The succulent, water-filled leaves provide a fire-proof barrier around buildings in fire prone areas. And Flame is a good barrier plant as it’s big enough to cover large areas of ground. 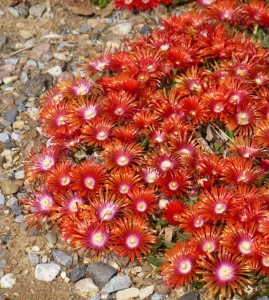 An improved hybrid of Delosperma dyeri selected by David Salman. Thanks to David Salman, High Country Gardens Chief Horticulturist for this piece. We are considering either the Red Mountain Flame or Alan’s Apricot for a ground cover. Concern is we live in zone 4-5 (Olympia, WA). We can get substantial water in the winter. Temp. should not be a problem. Will be planted on hill side with morning and early afternoon sun. Later afternoon is shaded. Will one of these work? Is there something else I should be looking at? As you alluded to, the hardy ice plants are not at all fond of wet feet in the winter. Of the two, though, Alan’s Apricot is much more adaptable to a wider range of conditions. I don’t think that you should count on delospermas to solve your groundcover needs in your Olympia location. Honestly, I’d check with your local garden center first, and get their advice. When considering groundcovers for slopes, it’s probably best to consider the most durable and hardy plants for your area, and especially those that offer dependable year-round interest. Best of luck! It would definitely be worth trying them in a south-facing raised bed, or other microclimate if you’re determined to try them there.